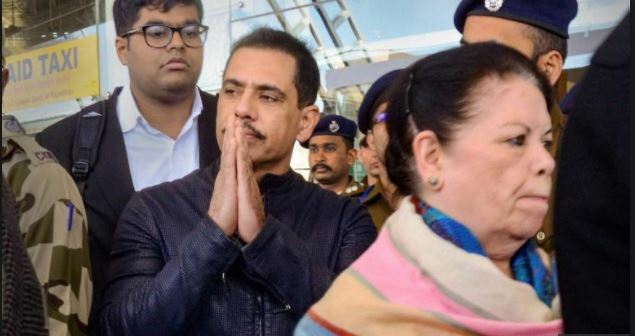 Congress president Rahul Gandhi's brother-in-law Robert Vadra and his mother Maureen Vadra appeared before the Enforcement Directorate office in Jaipur in connection with the Bikaner land deal case. This will be the fourth time Vadra appeared before the ED. He had appeared before the agency in Delhi last week in connection with a money laundering probe. ED in 2015 had registered a criminal case, taking cognisance of FIRs and chargesheets filed by the Rajasthan police after the a Bikaner tehsildar's complained about alleged forgery in the allotment of land in Bikaner district. The ED's quizzing of Robert Vadra is likely to centre around his alleged connection with a firm - Ms Skylight Hospitality Private Limited - which had purchased land in the area. In this case, the agency had summoned Vadra thrice but he failed to appear and later approached the Rajasthan High Court. On January 21, the Rajasthan high Court had asked mother-Son to appear for the ED investigation.